Ari Karai, the 74-year-old chief or cacique of Tekoa Ytu, one of two established Indian villages at the base of the peak, says the group intends to resist. “How can they evict us when this is recognised Indian land?” he asks. 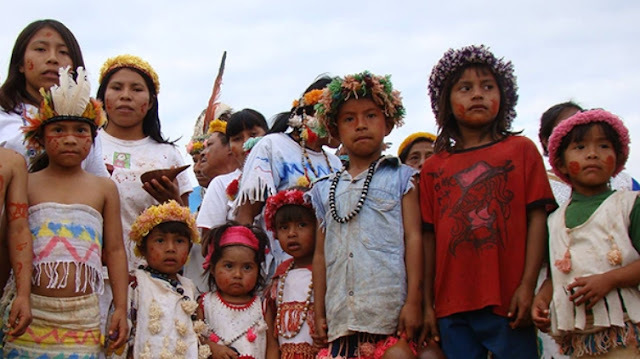 The dispute comes at a crucial time for Brazil’s more than 300 indigenous peoples. 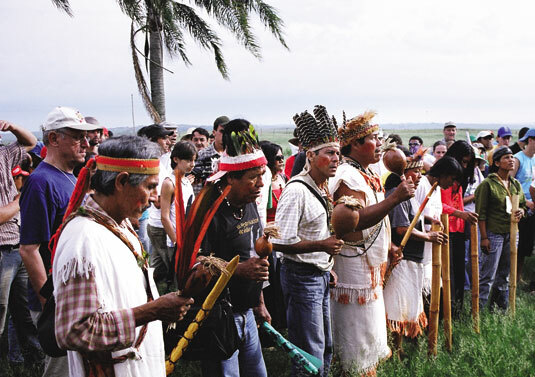 Earlier this month, more than a thousand indigenous leaders met in Brasília to protest and organise against PEC 215, a proposed constitutional amendment that would shift the power to demarcate indigenous land from the executive to the legislature – that is, from Funai, the Ministry of Justice and the president, by decree, to Congress. The Indians’ fierce opposition to placing demarcation in the hands of Congress is easy to understand: some 250 members of Congress are linked to the powerful “ruralist” congressional caucus, representing interests including agro-business and the timber, mining and energy industries. In contrast, there has been only one indigenous member of Congress in the entire history of Brazil: Mário Juruna, a Xavante cacique, who served from 1983-87 in Rio de Janeiro. The demarcation of Brazil’s indigenous territories, specified in the country’s 1988 constitution, was supposed to have been completed by 1993. Twenty-seven years on, the majority of territory has been demarcated, with 517,000 Indians living on registered land mainly in the Amazon region, but more than 200 applications are still in limbo. The movement is going to need every bit of solidarity, support and motivation it can muster this coming year, which will almost certainly see a vote on PEC 215. If passed, as it seems will likely be the case, the amendment also allows for the review of previous demarcations, and introduces exceptions to the exclusive use of protected land, including leasing to non-Indians and the construction of infrastructure, “in the public interest”. Responses to "'We're going to resist': Brazil's indigenous groups fight to keep their land in face of new law "